If Gov. Mark Dayton was hoping Minnesota newspapers would endorse his tax plan on their editorial pages, he may be disappointed. 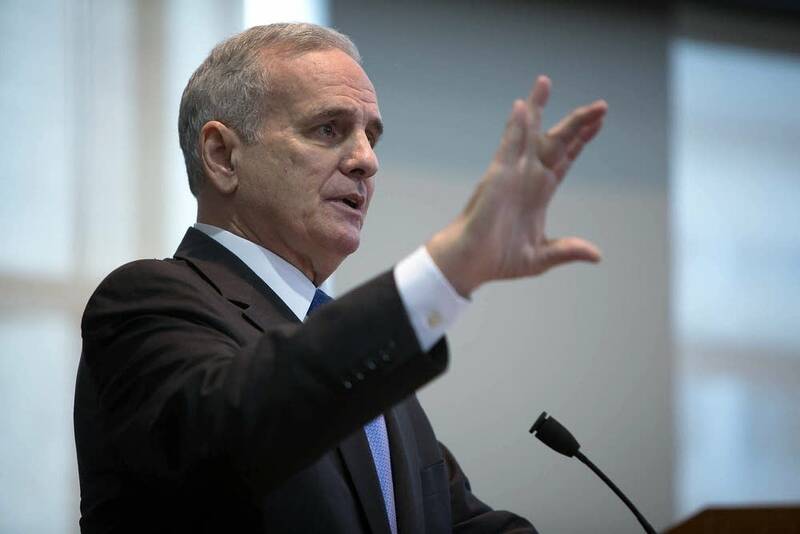 Dayton faced criticism on his budget proposal Thursday when he gave a speech to the Minnesota Newspaper Association at its annual convention in Bloomington. The newspaper industry is just one business pushing back against the governor's plan. Dayton said his budget plan, released on Tuesday, created a political blizzard because he is looking to erase a $1.1 billion projected budget deficit and spend another $1 billion on education and property tax relief. He acknowledged that a variety of groups are not happy with his tax overhaul, but he argued that it makes the system fairer for most Minnesotans. He also said he is working to fix a budget problem that has been papered over by other policymakers for the past decade. "My job is to take into account but also look into the big picture," Dayton said. "Again I say if the status quo solves the problem, I wouldn't be talking about any of this today, but it doesn't." Dayton's tax overhaul would increase income taxes on top earners and raise the cigarette tax. But his changes to the sales tax are drawing the most criticism. He wants to cut the sales tax rate by 20 percent but expand the tax to consumer and business services and clothing items that cost more than $100. Business groups and retailers complain that the proposal would cost jobs. As he spoke to the Minnesota Newspaper Association, several editors and newspaper owners complained that a sales tax on newspapers would hurt their industry. Tom West, the managing editor of the Morrison County Record in Little Falls, spoke about his concerns during a question and answer session. "We are the ones who cover local government and state government, and we are wondering why you would think it would be a good idea to have less information about government and what government is up to," West said. Others said that expanding the sales tax to newspaper ink, paper and advertising would result in job losses. Dayton said he understood the concern but did not back away from his plan. "You could basically start throwing out parts of our tax code and find a good economic justification for doing so and the question is then, what's left?" he said. "And is that the kind of state we want?" Dayton also insisted that most Minnesotans will not pay higher taxes. Because his plan includes a property tax break, business tax cuts and the lower sales tax rate, he contended that most people will not see much difference in the overall amount of taxes they pay. But Republicans, including Rep. Mary Liz Holberg of Lakeville, say that Dayton's tax plan will hit a broad swath of Minnesotans. "To say that it's not going to affect middle-income Minnesotans is just not fair," Holberg said. "You don't get $2.1 billion out of 2 percent of the population. They seem to think that businesses pay these taxes. Customers pay these taxes, and the last I looked the majority in Minnesota are middle-class people." Democrats, who control both chambers of the Legislature, have been walking a fine line in praising Dayton's approach but not fully embracing it. Dayton said those who are unhappy with his budget should specifically indicate where they would raise revenue or cut spending to fix the state's budget problems. Lawmakers aren't expected to come up with their own budget plan until early March. Subscribe to our politics newsletter. Tom Scheck is a reporter for APM Reports, American Public Media's investigative reporting and radio documentaries project.